WARNING: Do not continue reading unless you want to be mildly spoiled of the movie, My Week with Marilyn. 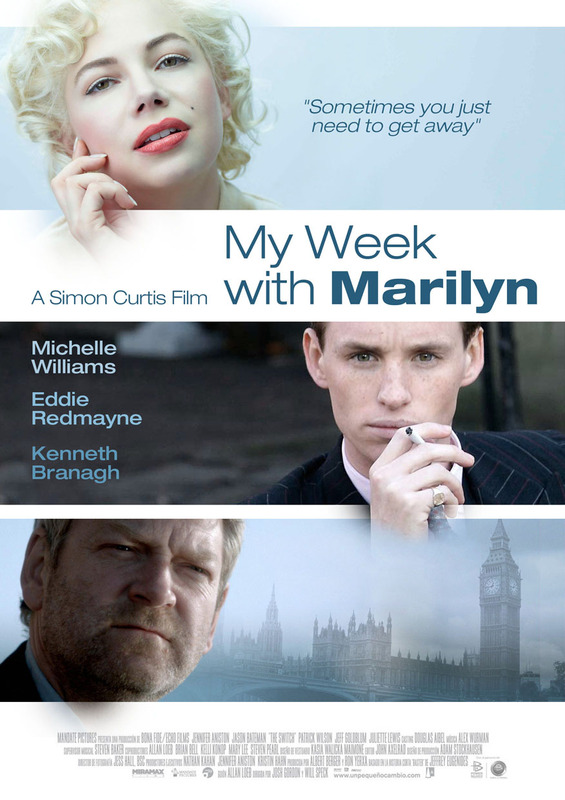 Another movie I’ve watched recently was My Week with Marilyn. Before I go any further let me first admit that I don’t really follow celebrities, past or present. In addition, I was unaware of the book the story was based on until the trailer for this movie came out, and I haven’t had the chance to read it. That being said, while I don’t know too much about Marilyn Monroe (shame on me, I know), I am familiar with some of her “trademark” habits that she’s famous for, like her singing and her breathy voice, characteristics that I think Michelle Williams played very well. Going on the assumption that most people watching the movie know something of Marilyn Monroe (perhaps just a sliver, like me) or the book this movie is based on, I’m just going to be very brief in my spoilers and review. Let me start by saying I was rather impressed with Michelle Williams’ acting in this film; I can’t remember where I read it, but prior to watching this movie I had seen a review where someone had said Williams just nailed the different sides of Marilyn she had to play–the weak and insecure Norma Jeane, the character Elsie in Sir Laurence Olivier’s The Prince and the Showgirl (1957), and of course, the alluring Marilyn Monroe. I’m just going to cut to the chase with this one; basically the story is like this: Sir Laurence Olivier (played by Kenneth Branagh) casts Marilyn Monroe (Williams) to play Elsie in his new movie, The Prince and the Showgirl. Colin Clark (Eddie Redmayne) is a young man trying to make his way in the film world and eventually becomes something called a “third director,” which is mostly just a fancy title for the set gopher. In the film, Colin basically comforts and is week-long fling for the confused Marilyn. The way Williams chose to interpret her for this film made her seem (to me, at least) like she had a multiple personality problem. The story that unfolds really shouldn’t come as a surprise. Colin gets warned numerous times that he shouldn’t fall for Marilyn’s “lost and scared girl act,” and he is also warned countless times to guard his heart, one person even telling him that he too had fallen in love for Marilyn and that it is extremely likely that Marilyn will eventually also drop him like it’s hot–which Marilyn does do towards the end of the film. I think that all the actors played their roles well, but I definitely think that Williams stood out, which was a pleasant surprise because quite frankly, I can’t really seem to think of another role that she’s acted in that was memorable. Also, while I think she may need to do a little more for me to stop thinking of her as Hermoine Granger from Harry Potter, I remember also being surprised upon seeing Emma Watson; in terms of looks, she’s really blossoming. (For anyone curious, Watson played Lucy, Colin’s semi-fling/girlfriend who was basically tossed away when he started getting Marilyn’s attention.) Redmayne does a great job playing the lovesick/starstruck Colin Clark, and I think that Branagh nailed Olivier’s accent (I don’t think I’ve really heard anyone else speak the way Olivier did, though if anyone would like to correct me, please feel free). Towards the end of the film, the expected pretty much happens when Marilyn tells Colin she thinks they should stop seeing each other, and how she plans to be a faithful and devoted wife to her current husband, Arthur Miller, a playwright who wrote Death of a Salesman (a 1949 play). Colin tries to convince her otherwise, but to no avail, and they go their separate ways. In a scene just before the movie ends, Marilyn enters the pub/inn that Colin is at to give him what I guess you could call a “proper goodbye.” The film concludes with Williams on a stage, singing a song, as Marilyn. There is no mention of how Marilyn died or about her death at all at the end of the film, though there is a bit of textual epilogue at the end of the film, giving a quick line or two about each of the main characters after The Prince and the Showgirl has been completed. The credits roll with several black-and-white images of Williams as Marilyn Monroe. While the story is nothing really to write home about, I think this film is worth watching just for Williams’ performance alone; I really do think she captures the essence of Marilyn Monroe. My overall opinion is pretty much as I state in my Movie Reviews Guide; not entirely awful, but not mind-blowing fantastic either. On a personal level, I might rate this movie a C+ or maybe even a B- (though I admit that might be a bit too far a stretch), but I think if I were to try and see this film through the lens of a typical movie-going audience as a whole, I think I’d have to say C. Aside from what I believe to be as solid acting from Williams and Branagh’s imitation of Olivier’s accent, I don’t think there was too much else that really jumped out at me about the film. Anyway, I’m feel like I’m on a roll again at last; I’m going to try and get a few more entries out before I finally call it a night.